It’s hard to argue with the view. On a beautiful day like last Friday, gazing straight out from the top of a small hill in tiny Cheverie, on Nova Scotia’s Noel Shore, you can see right across the Bay of Fundy. Or, you can turn your head ever so slightly to the left and look for wildlife and rising tides on Cheverie’s beautifully restored salt marshes. 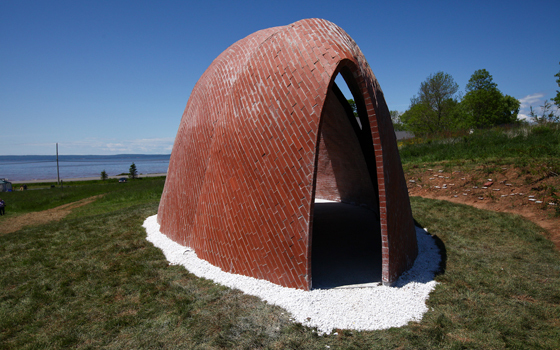 Now, thanks to Dalhousie architecture students in Ted Cavanagh’s Coastal Studio class, residents and visitors to Cheverie not only have an impressive new landmark on the salt marshes, but a whole new way of looking at the surroundings. 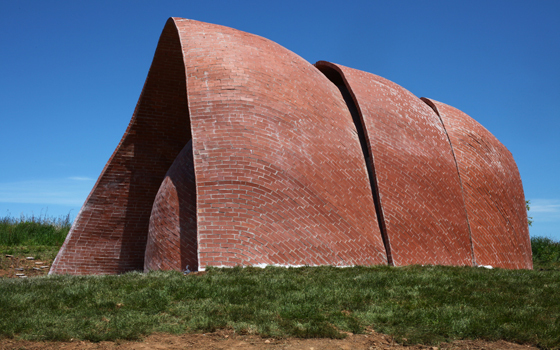 Started last summer, the unique-looking brick structure with three overlapping arches, hosts a camera obscura. When you walk inside its darkened interior, a live, real-time projection of the exterior is displayed on the concrete floor. The image was a bit blurry at Friday’s grand opening, but that’s only because it’s still a work in progress: this summer’s Coastal Studio class is still working on the camera obscura: improving the view, adding in a second viewpoint out to the salt marshes, and adding extra interpretative elements to show the marshes at various levels of tide, regardless of what time people drop in. Salt marshes are a crucial part of the coastal ecosystem: they exchange nutrients with coastal waters, support many varieties of flora and fauna, and help protect coastlines. However, the Cheverie salt marshes were in a very different state a decade ago: an undersized culvert running under Highway 215 linking Cheverie Creek to the Bay of Fundy had degraded the marsh, threatening its incredibly diverse ecosystem. That culvert was replaced in 2003 and, since then, members of the Cheverie Crossway Salt Marsh Society have been working to support the marshes’ health and transform the area into an educational opportunity for students, tourists and anyone else interested in learning more about marshes. The Coastal Studio, part of the Faculty of Architecture’s graduate program, has partnered with the society on this project. The studio gives students a hands-on opportunity to not only design creative, innovative structures, but to build them from scratch. Indeed, the camera obscura was built using a construction technique called Guastavino, named after a Spanish architect from the late 19th century. Likewise, the camera itself is also decidedly “old” technology, little different from how it would have worked a century ago. Over the past year, more than 30 students have worked on the structure, making road trips to Cheverie throughout last summer and well into the fall, picking it up again this spring. Though there’s more work to be done in Cheverie, it’s not happening just yet: right now, Prof. Cavanagh and the Coastal Studio students are spending two and a half weeks in the Southern U.S., learning about building in fragile environments, such as the Gulf Coast. You can review the entire history of the project, as it progressed, at the Coastal Studio's blog.